The opening flight of the £700+£70 PokerStars UKIPT Isle of Man Main Event is in the book with Donald Rae the hare leading the chasing pack. Rae can usually be found at the high stakes cash tables but showed he's no slouch in the tournament fold after bagging up 154,900 chips at the close. The 145 starters had been whittled down to just 46 after ten levels of action in Douglas yesterday. There was plenty of clash on show amongst the survivors who included former UKIPT Marbella winner Ludovic Geillich (123,700), 2013 runner up Fatima Moreira De Melo (91,600), UK tournament reg Simon Deadman (79,900), British Poker Award winner Sam Grafton (76,300), Full Tilt Ambassador Dermot Blain (38,700) and PokerStars pros Christophe De Meulder (36,600) and Mickey Peterson (26,300). PokerStars spokesman Lee Jones doesn't usually get to play in events sponsored by the site but made the most of his opportunity and bagged up 33,000 at the close. Defending champ Duncan McLellan was one of many notable names to fall at the first yesterday. Joining the two-time tour winner on the rail were EPT cashing machine Luca Pagano, Steve O'Dwyer, Eugene Katchalov and Sam Razavi. They'll be able to take another shot at claiming a chunk of the £350,000 guaranteed prize pool as a single re-entry is allowed on day 1b. That bumper prize pool is expected to attract a much bigger field than Thursday's opening flight. 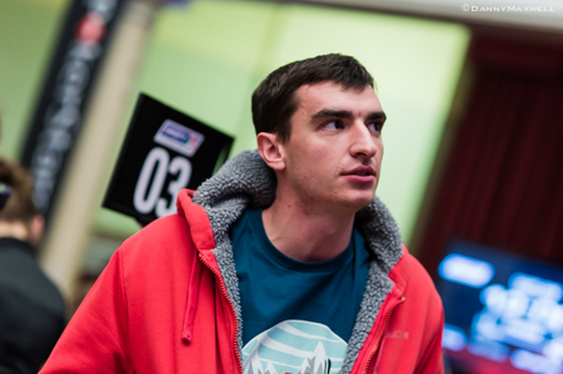 Among that number will be recent Bluff Europe interviewee Jake Cody and two time EPT winner Victoria Coren-Mitchell. Image courtesy of Danny Maxwell @ PokerStars Blog.